Nintendo has been gradually rolling out Labo support for their Switch games, but the latest example of this may surprise you. The company has announced that, on April 25th, you will be able to use the new Toy-Con VR Goggles in Super Mario Odyssey and The Legend Of Zelda: Breath Of The Wild. The Labo support will come via a free update. The official tweet, which includes a video, is down below. Just imagine Metroid Prime 4 with Labo VR compatibility! It’s ok. I don’t mind. Heh, nonono. We “must” make drama!! Been hoping for this myself. 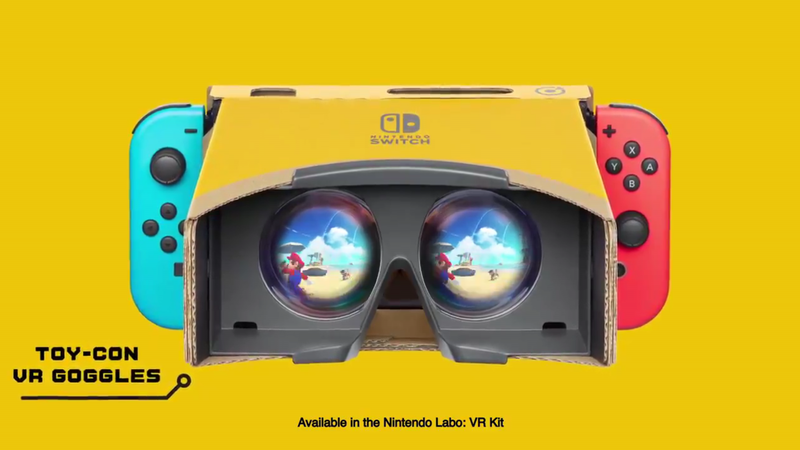 How good are the Labo VR Goggles? Are they worth getting? People did say that the experience was surprisingly good for the mini-games, even though the Switch isn’t ideal for VR, but you shouldn’t expect anything even remotely close to the proper, expensive, VR headsets. It’s more of a gimmick, kinda like using your smartphone for VR. This looks pretty cool and caught me by surprise! Okay, Labo, I’m sorry I doubted you!! All the VR headset needs is a compatible headstrap and this would be perfect. What makes you say they’re THAT proud? What makes you say they weren’t being so cocky that they forgot to add a headstrap after “completing” it? I mean it’s possible. I’m pretty sure Nintendo removed the head strap so they could lower the age recommendation (I don’t really have any proof for that though, it’s just something I’ve heard. They probably could make an “expansion pack” for more a more traditional experience. That would allow them to keep the age rating of the starter pack and allow the head strap. Wouldn’t Mario Kart be perfect for VR? Do your own Luigi Death Stare! Assuming turning camera was based on head movements at least. I mean heck without that as a factor and it seemingly not being first person view based, you could prob just stick it in the goggles now. Scratch that, needs to have image for each eye. 720p VR with a thing on your face that weighs a tonne. huh. A TONNE!! ! ! ! ! 1. It’s not attached to your face. There are no straps. You have to hold it. 2. It is literally just the weight of the switch in handheld mode, some cardboard, and 2 “lenses”. Will there be first person view then? I love this idea. I just hope it works. VR needs 60fps to work well, and BOTW, even though it is one of my favorite games, it is not perfect in the fps department. Let’s wait and see how it turns out. I am SO replaying BoTW. I just kind of wish they had done it in first person. If they had, the Nintendo Switch would be a vr GOD. Maybe in a future update (or a mod)? Also, I’m gonna need to make a DIY strap. …Its already in first person.